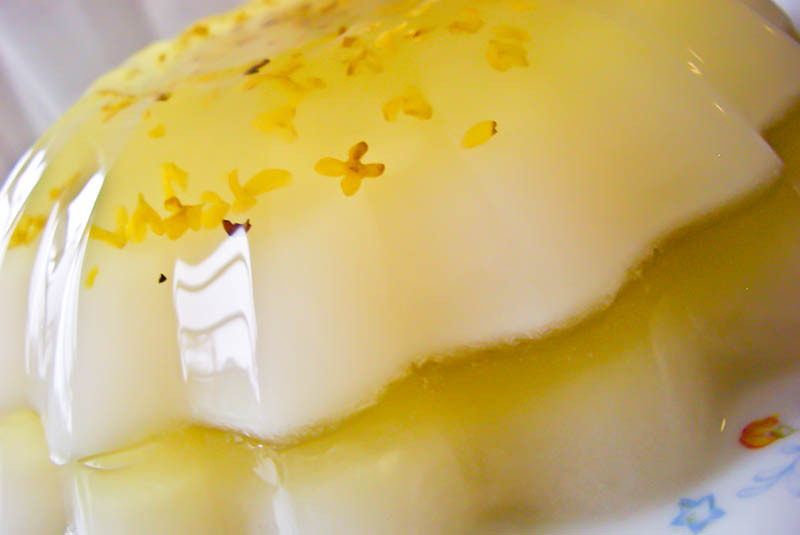 On a recent trip to Hong Kong, I came across a dessert called Osmanthus jelly. Apparently this is very popular in Hong Kong especially during summer as it is supposed to be 'cooling". 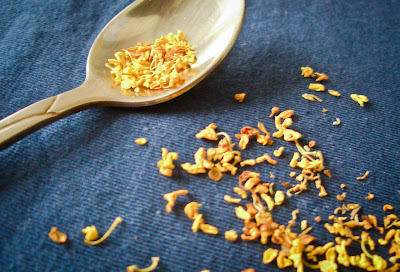 Its made with dried osmanthus flowers 桂花 or "gui hua". Piqued by this, I went to the neighbourhood Chinese medical hall to look for it and was pleasantly surprised that it was sold here. The dried osmanthus flower is really pretty to look at, and it has a lovely delicate scent. It's hard to describe the scent; a light sweet-ish floral (duh) aroma. I tried to re-create the dessert that I had, with alternate layers of coconut and osmanthus jellies. And since I really dislike using gelatine (it's one of those pet peeves with no basis what-so-ever), agar-agar was used as a substitute. In a pot add water, sugar, agar agar powder and bring to boil over medium heat. Transfer half of the agar mixture to another pot and stir in the osmanthus flowers. With the remaining half, stir in coconut powder. 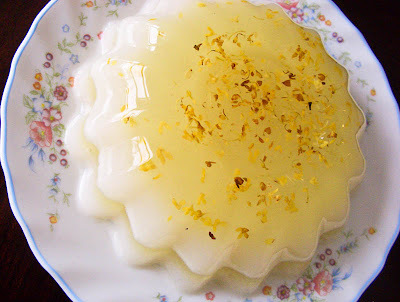 Pour 1/2 of the Osmanthus jelly into the mold. When slightly firm to touch, add 1/2 of coconut layer. Continue process with the remainder. Leave to cool at room temperature and refrigerate Osmanthus jelly to set. Serve chilled. is it like chrysanthemum tea? pretty jelly. Hi MM - the flowers are smaller, and yes it is quite pretty.